The Nazis grew out of a small right-wing party, which Hitler took over after 1919. He developed a Twenty-Five Point Programme based on hatred, and built up a paramilitary group (the SA) to defend his meetings and attack other parties. The Nazis appealed to a wide range of people, but especially the 'middling' sort of people, and the party grew rapidly in the years of crisis 1919-1923. After the disaster of the Munich Putsch, and during the prosperity of the Stresemann years, however, support for the Nazis fell. During this time Hitler believed that he could be elected to power. He used these years to develop and strengthen the party's organisation. • The Versailles Treaty and the ‘November Criminals’ (the politicians who signed it). In 1920, the party renamed itself the National Socialist German Workers’ Party (Nazis), and announced its Twenty-Five Point Programme. At first, the Nazis were both nationalist (they believed in Germany’s greatness) and socialist (they believed the state should benefit everybody equally). • National Socialism – loyalty to Germany, racial purity, equality and state control of the economy. • Racism – the triumph of the Aryan race by armed force, because all races, especially the Jews, were inferior to the Aryan (pure German) ‘Master Race’. • Lebensraum – to expand into Poland and Russia to get ‘Living Space’. • Strong Government – complete obedience to the Führer. At first, there were a number of people involved in running the party, but Hitler soon became the sole boss, and he built up the organisation so that he was unquestioned leader. This Nazi poster, 11 May 1920, advertises a speech by Hitler: ‘What Do We Want?’ It reads: "Do not believe that other parties can save the Germany of misfortune and misery, the nation of profiteers and debt, the land of Jewish corruption!" In the future we may be faced with problems which can be solved only by a superior race of human beings, a race destined to become master of all the other peoples and which will have at its disposal the resources of the whole world. At first the Nazis were just another right-wing terrorist group. Nazi ‘Stormtroopers’ attacked opposition parties. After the failure of the Munich Putsch, Hitler decided that he would have to get power by being elected, rather than by rebellion. However, he was banned from speaking until 1928. The prosperity of the Stresemann years, also, meant that the Nazi’s message became less appealing and the party lost support. Copy the figures from the table below into an Excel workbook and use the Chart wizard to draw a graph of party electoral fortunes 1919–1933. 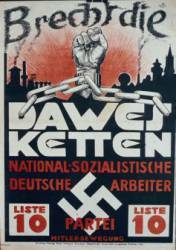 This Nazi poster from the 1928 election reads ‘Break the Dawes chains’. Support for the Nazi Party had grown due to the country's problems of hyperinflation and the French invasion of the Ruhr. By 1928 Nazism appeared to be a dying cause. Now that Germany's outlook was suddenly bright, the Nazi Party was rapidly withering away. One scarcely heard of Hitler or the Nazis except as a joke. William Shirer was an American journalist who lived in Germany from 1926 to 1941. • He reduced the number of Stormtroopers (SA) and set up the SS, a personal bodyguard fanatically loyal to himself. • He set up a network of local parties. He merged with other right-wing parties, then took them over. • He set up the Hitler Youth, which attracted young people to the party. • He put Josef Goebbels in charge of propaganda. Goebbels and Hitler believed that the best way to get the support of the masses was by appealing to their feelings rather than by argument. 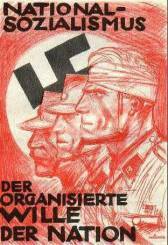 They waged a propaganda campaign using posters, leaflets, radio and film, and organised rallies. • He cultivated the support of wealthy businessmen promising them that, if he came to power, he would destroy Communism and the Trade Unions. This gave him the finance to run his campaigns. This Nazi poster c.1927 reads ‘Despite the Ban, not dead’. 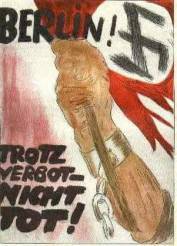 This poster was drawn by "Mjölnir," (real name was Hans Schweitzer) who set new standards for Nazi publicity.